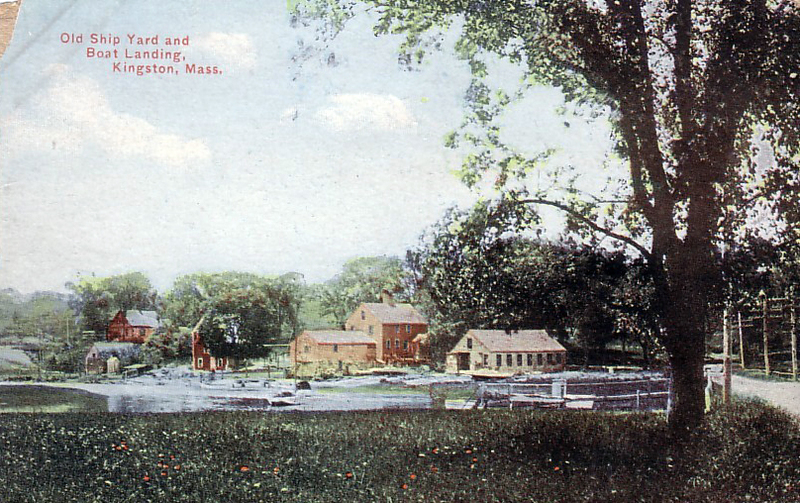 Postcard of an idyllic view of the Landing, circa 1910. George Shiverick’s boat shop, part of today’s Jones River Landing, is to the right of the Drew house. Colonial development along the Jones River favored major iron works and shipping industries. The Jones River powered some of the most productive early businesses; sawmills, anchor works, tool making, tack factories, agriculture and eventually woolen factories. Early residents of the town practiced complex management of the water resource by operating seasonal dams to hydropower sawmills and forges until April 1st each year when dams were removed and the annual migration of anadromous fish began. Farming followed throughout the season on the rich bottom lands along the river until timber harvests the following winter and reconstruction of the dams. Early in the 1900s, Forge Pond dam (1905) and Triphammer (Wapping Road) dam were cast in concrete. Forges and mills began to operate year round, though low flows and low head caused significant problems and fish migration was interrupted. For a time leases were granted to fishermen to carry bushels of herring and smelt beyond the dams to grow them commercially but this practice died off in the last half of the last century. Today, land use in the Jones River watershed is dominated by housing and the businesses to support a consumer society. A regional school, regional shopping mall, layover yard for the regional commuter train to Boston, a new major east-west highway, new town hall, police and fire, and local schools have all been constructed in the last fifteen years. Annual growth rate in Kingston has been sustained at about 30% during that period. The abutting communities of Pembroke and Plymouth have also experienced exponential growth during the same period. Former farmland is being converted to relatively dense housing under the states 40B zoning law. Large sand and gravel operations which dominated the landscape for the last forty years are now giving way to business, industrial development and denser 40R housing. Much of the watersheds gravel soils have been used as fill in development projects such as Bostons Logan airport, the Big Dig, and Hingham septic fields. Development, as in many parts of the Commonwealth, has increased impervious surfaces and black-top parking lots, and concrete foundations are taking notable shape on the once rural landscape. Thank you Kingston residents for voting to preserve our heritage! The Jones River was formed as the outlet to Glacial Lake Taunton about 15,000 years ago. It is the largest river draining to Cape Cod Bay, and represents a habitat demarcation zone for a variety of species. The river is a low gradient coastal stream, 7.5 miles in overall length of the main stem with nine contributing subwatersheds. The Jones River watershed is thirty square miles overall, and includes the four Silver Lake towns of Kingston, Pembroke, Halifax, and Plympton as well as portions of Duxbury and a very small part of Plymouth. The major tributaries of the River are Smelt Brook, Halls (Stony) Brook, Furnace Brook, Fountainhead Brook, Jones River Brook, Pine Brook and Silver Lake. The Jones River headwater, Silver Lake, is largely spring fed, and at 80 feet deep and a mile square, is one of the largest natural lakes in Massachusetts. This remnant of the Wisconsin period is the likely apex of the Plymouth-Carver Aquifer and is near the surface divide of Jones, the North, and Taunton River systems. For the last 100 years, the lake has been most valued for its water supply everyday 10 million gallons are diverted to Brockton and flushed down the Taunton River. The Silver Lake watershed represents about 20% of the Jones River watershed that drains to the main stem above the Elm Street dam. USGS has maintained a Stream gage at Elm Street since the mid-1960’s. The town of Kingston recently upgraded this gage for instantaneous readings which can now be accessed via the USGS Stream Stats at usgs.gov. Until recently, loss of flow from Silver Lake to the Jones River as a result of the diversion was an accepted practice. Excerpts from Chapter 5 of the Southcoastal Watershed Action Plan.